Brazilian shoe brand Melissa has launched a brand new plastic shoe - to be customised by you! SEE OUR PICK OF THE BEST NEW SEASON SHOES HERE! 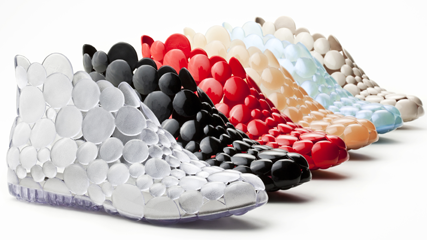 The customisable plastic disc shoes are designed by leading international architecture and design specialist Gaetano Pesce. Made up of mismatched plastic spheres, customers are able to cut the edges to create new styles – so from ballerina flats, to flip flop sandals, to the classic ankle boot, it’s time grab a pair of scissors and channel your inner Tamara Mellon. Avant-garde, futuristic and completely unique – this is arguably Melissa’s most revolutionary shoe to date. Available in six different colours; black, red, off-white, blue and translucent orange, this is the perfect opportunity to create some fabulous footwear, as designed by you! The shoes launch in Selfridges on Sunday 7th November, with a 3-week exhibition.